FPA™ of the Suncoast promotes universal acceptance of the value and necessity of the financial planning process. We elevate the profession and help a lot of people along the way. FPA members adhere to the highest standards of professional competence, ethical conduct and clear, complete disclosure to those they serve. 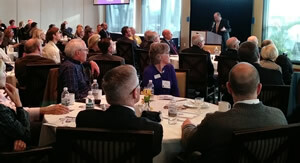 William A. Strauss, a senior economist and economic advisor in the economic research department at the Federal Reserve Bank of Chicago, addressed a full house at the Sarasota Yacht Club on February 1. His presentation "U.S. Manufacturing in a Global Context" is available for download.